The latest section of the memorial is dedicated while construction crews work on the next extension. WASHINGTON—In the wake of the 4,000th U.S. military death in Iraq, the American Battle Monuments Commission announced Monday that, for the fifth time in the last 12 months, it will resume construction on the poignant final tribute to the brave men and women who continue to give their lives in the Iraq War. 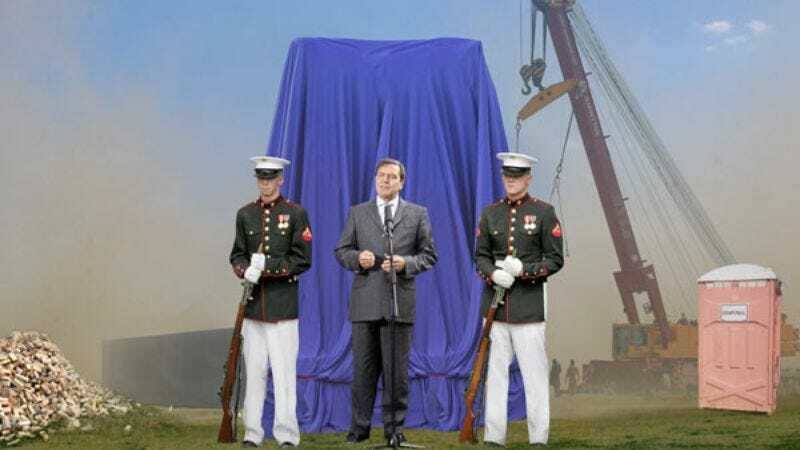 According to ABMC spokesperson Charles Masterson, ground was first broken for the memorial on the National Mall in May 2003, shortly after President Bush declared the end of major combat operations in Iraq. Since the completion of the preliminary monument, however, nearly two dozen extensions have been added to the original structure to properly commemorate subsequent casualties in the conflict. "After the president's 'Mission Accomplished' speech aboard the USS Abraham Lincoln, we took our cue and immediately began erecting a touching, lasting memorial to those who had made the ultimate sacrifice in order to bring a swift end to the war," Masterson said. "And, just a few months later, we incorporated a second stirring section into the monument to venerate the additional heroes who gave their lives defending freedom." "At present, there is no time frame for completing the monument," Masterson added. Masterson maintained that the memorial is a fitting paean to the Americans who continue to die in Iraq, while admitting that there have been some unforeseen spatial challenges presented by the rapidly advancing monument. "With so many more patriots to honor, we've been forced to extend the memorial past the entrance to the Washington Monument and into the southbound lane of 14th Street," Masterson said. "Blocking traffic is a small price to pay, however, considering the debt of gratitude we owe our fallen soldiers. And we're confident Americans will continue to support us when we build the monument's east wing directly through the Capitol Building next month." The initial memorial, a somber wall of polished black marble, hand-etched with the full names, ranks, hometowns, and the birth and death dates of the 139 military personnel killed during the invasion, was designed by world-renowned architect Kai Tomasson in July 2003. In October of that year, its stark yet elegant imagery was augmented with another 10-foot wall, and in March 2006, Tomasson submitted blueprints for the monument's second level. Though the memorial committee had spent its $12 million budget by late 2005, Tomasson volunteered his services for 19 additional adjustments before handing over the reins for this latest extension to DiForetti & Sons, a D.C.-area contractor known for reliability and honesty. ABMC officials said they are dedicated to completing the Iraq War Memorial, despite mounting financial concerns. The commission has raised extra money through a number of individual contributions, including a donation of 50 sheets of plywood from the Home Depot, which will be used in the upcoming portion. In addition, a congressional subcommittee was formed to help secure funding and building materials for the remaining 15 to 20 years of construction. "The goal is to come up with cost-effective, creative solutions to respectfully eulogize our fallen heroes," said Sen. Dianne Feinstein (D-CA), who cited a recent decision to construct a part of the monument out of papier-mâché, and another proposal to type the names of newly fallen soldiers on sturdy index cards, which would be kept in a box near the memorial. "So we urge the president to sign our bill to allow the ABMC to strip marble slabs from the steps of the seldom-visited Jefferson Memorial in order to help complete this timeless monument." "Because our grandchildren should be honored just as much for their service in Iraq," she added. While some have complained that it is difficult to find family members' representations on the monument following a cost-cutting decision to include only the deceased's initials, the majority of loved ones have reportedly been pleased with the progress. "I'm grateful that the government is so committed to honoring our troops," said a tearful Nancy Ruhl, holding several rubbings of etched initials that she hoped were her son's. "I'm just so glad that [Marine Lance Cpl.] Jack [Ruhl] got to see the memorial in between his third and fourth tours of duty, right before he was killed in the Anbar province and was added to it." Once work is completed on the ongoing Iraq War Memorial, the ABMC will reportedly begin planning the War in Afghanistan Memorial Mobius Strip.